TORONTO — Shoppers Drug Mart has enhanced its Shoppers Optimum loyalty program with a new platform designed to bring a personalized digital experience. Called “My Optimum. My Rewards.”, the new offering includes an enhanced Shoppers Drug Mart app and a digital Optimum card, which the Canadian drug chain said will make it easier for customers to earn additional rewards. 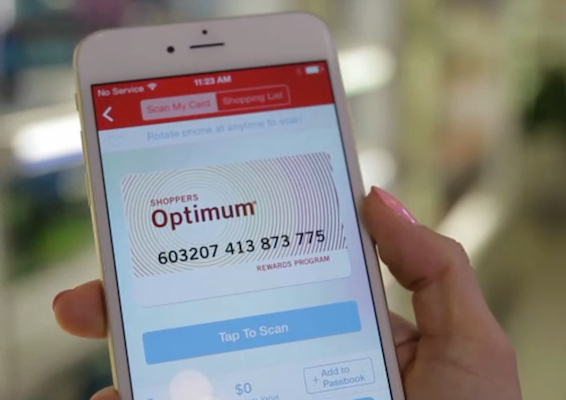 Shoppers Optimum members will now receive personalized offers and points via their mobile device, email or the web (at myoptimum.ca) and will be able to load them to their digital or plastic Optimum card. They can also scan their digital Optimum card directly from their smartphone to earn and redeem points, Shoppers Drug Mart said Thursday. The new Optimum digital platform delivers weekly load-to-card offers tailored to members’ shopping preferences, including a personalized flyer picking the relevant promotions for each customer. The drug chain noted that Optimum members will get offers on products they want and use — ranging from cosmetics and skin care to vitamins and snacks — that will allow them to earn rewards faster on daily purchases plus special offers on new items. Launched in 2000, the Optimum program now has 10 million active members. The new digital features for Optimum members include personalized offers arriving every Saturday via email, web or to a smartphone; a personalized flyer, based on individual shopping preferences, selecting the most relevant products on promotion; the ability to view and load offers from a mobile device or the new Optimum website; and the ability to scan their digital Optimum card to earn or spend points at checkout. Optimum members also will be able to check Optimum points balances on the go; transfer Optimum points to a loved one’s account; donate Optimum points to a favorite charity (including the Canadian Red Cross for the Nepal Region Earthquake Fund); browse store flyers and create shopping lists; manage prescriptions; find the nearest Shoppers Drug Mart or Pharmaprix store; and add their Optimum card to Passbook on an Apple iPhone. The digital Optimum card is now available for Apple and Android devices by downloading the redesigned Shoppers Drug Mart mobile app, which the drug chain said is one of Canada’s most downloaded apps. Shoppers Drug Mart, part of Loblaw Companies Ltd., has 1,258 drug stores under the Shoppers Drug Mart and Pharmaprix banners across Canada, as well as 51 Shoppers Simply Pharmacy/Pharmaprix Simplement Santé medical clinic pharmacies, six Murale luxury beauty stores and 70 Shoppers Home Health Care stores.